Distant view shows lesser normal-appearing abduction left cord (right of image) during breathing, suggesting that the left posterior cricoarytenoid muscle is working. Note the lesser bulk of the left vocal cord as compared with the right, although this is subtle at this viewing distance. At closer range, still in breathing position, one can see more easily the “linguine” of the right vocal cord (left of image) compared with the “spaghetti” and slight bowing of the left. These findings correlate with left thyroarytenoid (TA) muscle weakness and atrophy. In phonatory position under strobe light, the bowing of the left cord (right of image) is more evident, as is the lateral turning of the left vocal process, consistent with weakness of the left lateral cricoarytenoid (LCA) muscle. Lines denote the direction each vocal process is pointing. One week after placement of a large silastic implant into the left vocal cord(right of image). Notice the temporary eversion of the left ventricle, almost simulating a large polyp. 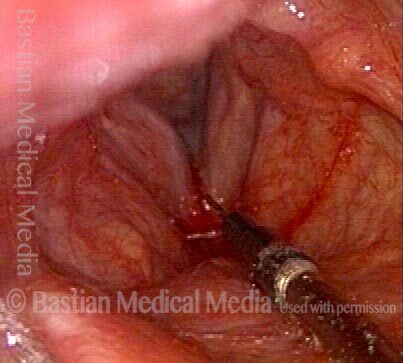 A few months later, fullness of left vocal cord (right of image) remains, but eversion / edema of ventricular mucosa has resolved. Compare with image 1. During phonation, much better closure (with markedly improved voice) but still slightly lateral turning of the left vocal process (right of image). Compare with image 3. Panorama shows normally functioning PCA muscle (supplied by posterior branch), indicated by abduction of both vocal cords to a fully lateralized position. 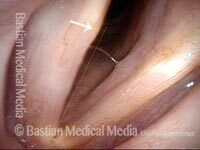 As vocal cords just begin to move to adducted, phonatory position, note that the left cord (right of image) leads medially with the tip of the vocal process, while right vocal process remains turned laterally due to paralysis of the LCA muscle. Close-up of posterior commissure during phonation shows continuing lateral pointing of the right vocal process (left of image), again due to a paralyzed LCA muscle. Panoramic view during phonation shows lateral buckling due to flaccidity of paralyzed TA muscle, left vocal cord (right of image). 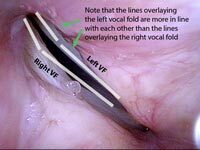 A needle is being inserted into the TA muscle to inject voice gel as a temporary implant to plump up the cord so that the left cord (right of image) will be able to "reach" it during phonation—and also, to counteract the flaccidity seen in photo 4 above. After plumping of the right vocal cord (left of image) with voice gel is completed. Phonation after voice gel injection, standard light. Note better closure of the cords. Phonation under strobe light, open phase of vibration. This view shows that the voice gel has abolished the flaccidity seen above in photo 4. This photo verifies that both PCA muscles are working (note the wide, bilaterally equal abduction of the cords). It also indicates TA weakness on the left (right of photo): the left side (right of photo) is “spaghetti” differing from the right side’s (left of photo) “linguini.” Furthermore, the conus bulge (indicated by 'X') is missing on the left (right of photo). LCA function has not yet been determined. At the beginning of adduction for voicing, note that the right cord (left of photo) has already come to the midline, and vocal process is turning medially. Left side (right of photo) will come somewhat to the midline likely due to IA function due to its bilateral innervation, and also perhaps CT function. Strobe light during phonation. “Most closed” phase of vibration is in fact not closed, due to unopposed pull (even if just baseline tone) of left PCA muscle (right of photo). Note as well that the vocal process on the left (right of photo) points laterally due to LCA weakness; on the right, intact LCA side (left of photo, the vocal process turns medially. Strobe light during phonation. Open phase reveals the increased amplitude of vibration of left cord (right of photo), validating in a second way the weakness of the left TA muscle (right of photo). Right vocal cord paresis (left of image). Note marked atrophy as compared with the left cord. Highly lateralized position denotes some persistent action of the right posterior cricoarytenoid muscle. Initiation of phonation. Note medical turning of left vocal process of arytenoid (right of image), and absent movement of the right vocal cord. Neither thyroarytenoid nor lateral cricoarytenoid muscles are innervated. 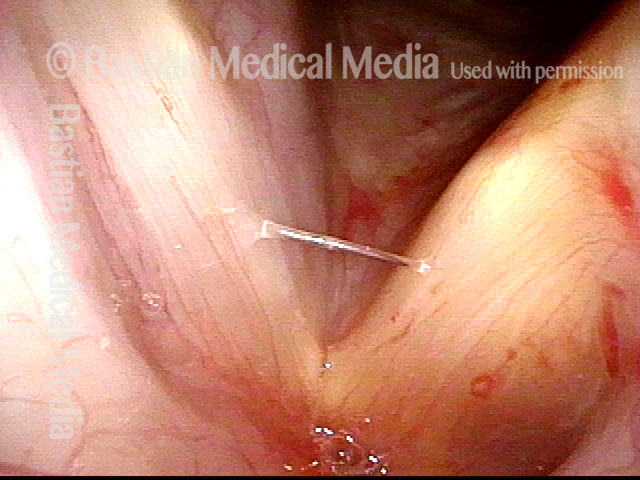 Immediately following injection of right vocal cord (left of image) with voice gel, with patient in videoendoscopy room chair, under topical anesthesia. Note bulging of right vocal cord. 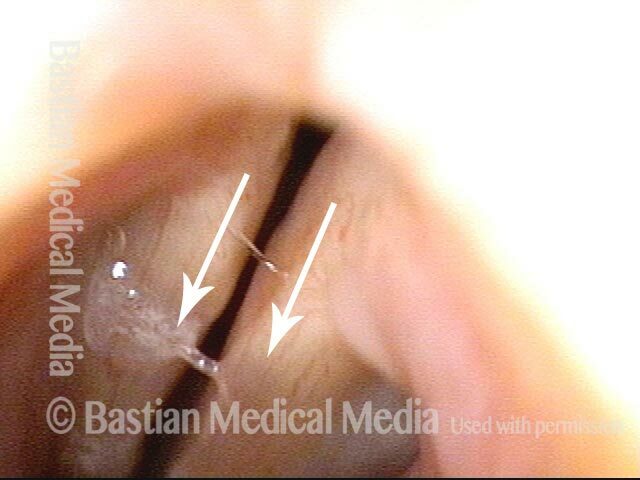 A month later, showing plumping up of the right vocal cord (left of image) with voice gel. Vocal cord continues to abduct fully, due to functioning posterior branch of recurrent nerve, which innervates the posterior cricoarytenoid muscle. Phonation. There is some movement to the midline due to the bilaterally innervated interarytenoid muscle. The lateral cricoarytenoid muscle is paralyzed, as seen in lateral turning of the vocal process. Voice is dramatically improved as compared with pre-injection. The voice gel will be expected to gradually absorb over three to nine months, during which time the anterior branch of the recurrent nerve may recover its function. Left vocal cord “paralysis” (TA, LCA, primarily, with suggestion of slight PCA activity). In breathing position, one can see the left cord (right of photo) bowing and the capacious ventricle, indicating TA weakness. Intermediate abducted position of left cord suggests some PCA function remains. During phonation, lateral turning of the left vocal process (right of photo) indicates LCA weakness, as does the large phonatory gap. Six weeks later, there is definite improvement of voice, though it remains abnormally weak. In this abducted (breathing) position, note that the left cord (right of photo) is less bowed and the ventricle is less capacious. This would be viewed as more than a “soft” finding, requiring skeptical, nuanced observation and some suspension. Compare with photo 1. During phonation, one can see closer approximation. The vocal process on the left (right of photo) no longer turns laterally, even when using low pitch in an attempt to accentuate this finding. 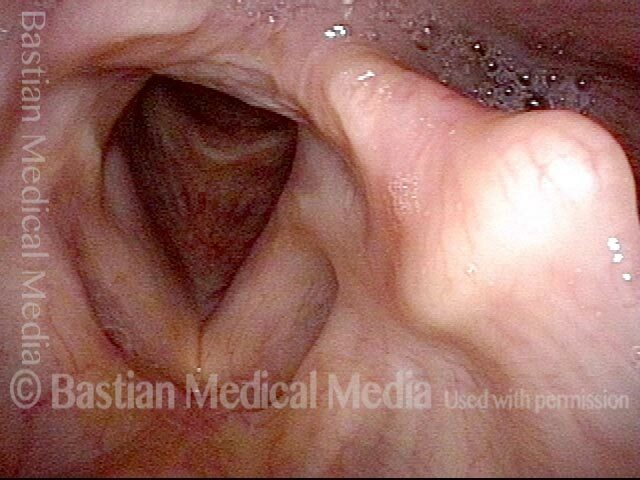 Paresis, right vocal cord (left of image). Notice the slight loss of muscle bulk on the right cord as the upper surface dips subtly into the ventricle, whereas it remains a more flat upper surface farther laterally into the ventricle on the left. Phonation under strobe light: the right vocal cord process turns slightly laterally due to LCA muscle weakness. The membranous cord also buckles laterally due to its underlying TA muscle atrophy and flaccidity. This patient has idiopathic right TA + LCA paresis. From a distant view, the unopposed pull of the right PCA (left of photo) can already be detected, but is better seen in the next photo. At closer range and in a breathing position, both PCA muscles work to fully lateralize the cords. The right (left of photo, in red) TA paralysis/atrophy is seen via a spaghetti-linguini difference in the cords and a larger, deeper right ventricle. Most notably, the right vocal process pulls laterally because the paralyzed LCA does not resist unopposed pull of the active PCA. Beginning to approach phonation position, the cords begin to move to the midline via function of the IA muscles, and the left cord (right of photo) reaches the midline via function of the left LCA muscle. Absent function of the right LCA and TA (left of photo) continues to be seen clearly in this view. During phonation, vibratory blur is seen under standard light, and lateral buckling of the flaccid right cord (left of photo). Soon after a simple medialization of right cord (left of photo) with a silastic wedge, resulting in the plumpness of the right cord. Compare with photos 1 and 2. Again beginning to approach phonation position. See again the plumpness of the right cord (left of photo). Compare with photo 3. During phonation, there is much better contact between the cords, and the right cord (left of photo) is no longer flaccid. Compare with photo 4. 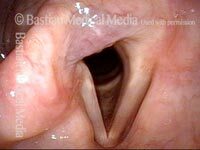 Panoramic view of the larynx with the cords in full abduction. Note the asymmetry — particularly the bowed free margin on left (right of image), and capacious ventricle. Close-up at near-closure for phonation. Equal bilateral adduction and matching angles of medial line of aytenoid cartilages demonstrates that LCA muscles are working bilaterally. This appears to be a paresis of TA muscle alone. Close-up view, in abducted, breathing position. The "spaghetti" of the left cord (right of image) does not match the normal "linguini" of the right cord. Also, note the left cord bowing and capacious ventricle. During abducted breathing position, note the atrophy of the left cord (right of image), mild margin convexity, and the capacious ventricle (at bottom-right), all of which indicate TA paresis. The cord abducts fully, demonstrating intact PCA fuction. LCA function cannot be determined in this view. Adducted position for phonation, with phonatory blurring as seen under standard light. LCA appears to be functioning, as indicated by the strict anterior-posterior direction of the left vocal process (right of image), just the same as for the right. This accounts for quite good approximation of the cords. The ventricle again appears capacious (dotted oval). Based upon these first two photos, we can surmise that this is a TA-only paresis. Under strobe light, showing increased amplitude of vibration of the left cord (right of image). This finding suggests in yet another way that the TA muscle is paralyzed. After placement of an implant into the left cord (right of image). Note the bulging of that cord and straightening of the cord's margin, and also that the ventricle on that side no longer appears capacious. Compare with photo 1. Under strobe illumination. Note that the lateral excursion of both cords is the same, since the left cord (right of image) is now less flaccid. Compare with photo 3. 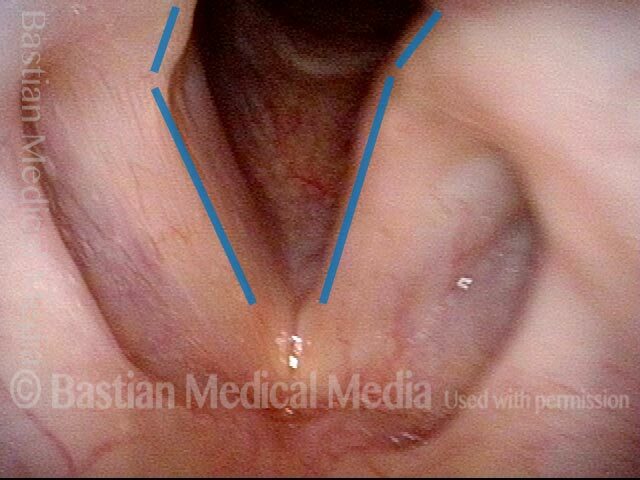 PCA muscle of the right vocal cord (left of image) is not working. 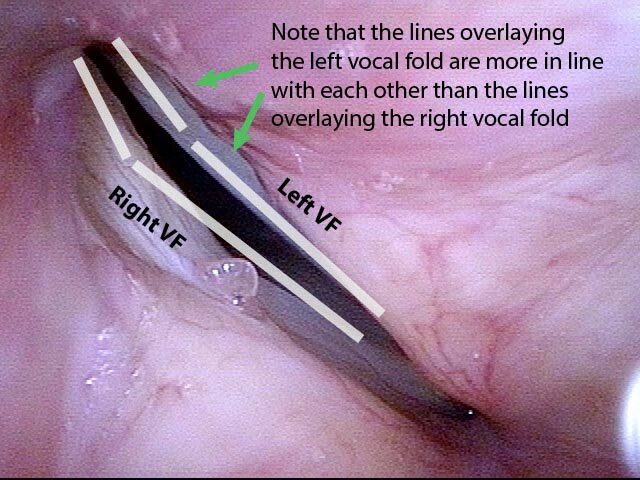 TA and LCA are perceived as intact, based on the combination of: 1) normal voice; 2) the right cord is not bowed; 3) ability to medially turn or at least keep in line the right vocal process (see also photo 2); and 4) the right cord is not atrophied, nor is the right ventricle unusually capacious. During phonation, there is no sign of lateral turning of the right vocal process, which would indicate LCA weakness. Furthermore, vibratory blurring (in this standard-light view) appears to be fairly equal on each side, suggesting there is no flaccidity of the right cord, contrary to what one would expect were the TA weak on that side. Strobe light, closed phase of vibration, again showing that there is no lateral turning of the vocal process. Strobe light, open phase of vibration. The amplitude of vibration for each cord appears to be equal, just as it did (based on blurring) in photo 2. This finding confirms that the TA is not weak, as such weakness would make the right cord flaccid and increase its amplitude of vibration. Several years after right (left of photo) thyroid lobectomy. Voice was drastically altered for a few months but then seemed to recover fully. Panoramic view during sniff maneuver shows midline but immobile right vocal cord (left of photo). No apparent atrophy of the cord itself, and the vocal process turns medially (arrow) suggesting that voicing muscles TA, LCA are intact and not balanced by PCA, because PCA muscle is paralyzed. This would explain patient’s normal voice, yet immobile cord. Closer view, with same findings as in photo 1. View of posterior commissure just before reaching contact for phonation. Note that both vocal processes are aligned antero-posteriorly (see arrows). This indicates a functioning LCA muscle on the right, and not only on the left. During phonation, standard light, the cords appear to approximate firmly. Closed phase of phonation, strobe light, at very low pitch (E3, or 165 Hz). The lowest part of patient pitch range would be expected to accentuate flaccidity, if present. Open phase of vibration, still at E3 (165 Hz). Vibratory amplitude is equal between the cords, demonstrating no increase of flaccidity of right cord (left of photo) as another way of “proving” that TA musculature is normal. As the patient is taking a breath, only the right cord (left of photo) abducts (though not yet fully in this photo). 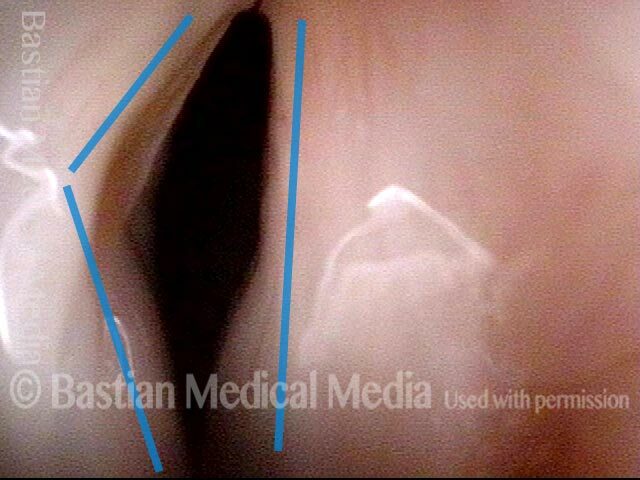 Left cord (right of photo) remains at midline and vocal process remains in line with the membranous cord, suggesting that the LCA muscle on the left (right of photo) is working. Full approximation of the cords, and furthermore there is no enlargement of the ventricle (at 'X') and this also suggests left TA muscle is also intact. The posterior commissure during phonation. Note that there is no lateral turning of the vocal process, validating that the left LCA muscle (right of photo) is intact. During phonation, strobe light, open phase of vibration. Left TA (right of photo) function again validated in that the amplitude of vibration on the left (right of photo) is not greater than on the right (left of photo). If the left TA muscle were paralyzed, then the amplitude on the left (right) would be greater than on the right (left). This patient describes his voice as being extremely weak with an abrupt onset that was unrelated to intubation or any other injury. The patient's voice sounds extremely breathy regardless of vocal task. The amount of bowing seen here cannot fully explain the breathy (air-wasting) dysphonia that is heard. An intense visualization of the posterior commissure begins to reveal the mystery. While the "toes" (indicated by each letter T), or vocal processes of the arytenoids, come into full contact, the "heels" (indicated by each letter H), or bodies of the arytenoid cartilages, do not. 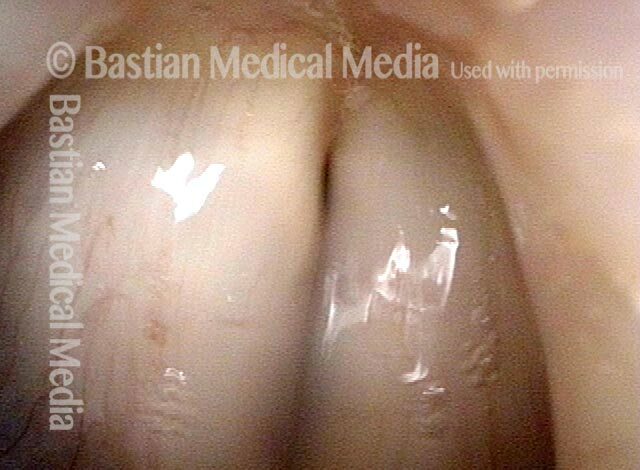 An even closer view shows the persistent posterior commissure gap. The elicited cough shown in this image proves that the patient is physically unable to close the posterior commissure. An elicited Valsalva maneuver, which also fails to close the posterior commissure. High-resolution CT was performed to prove there was no abnormality of the cricoid or arytenoids which might account for this finding of apparent interarytenoid paresis or avulsion.